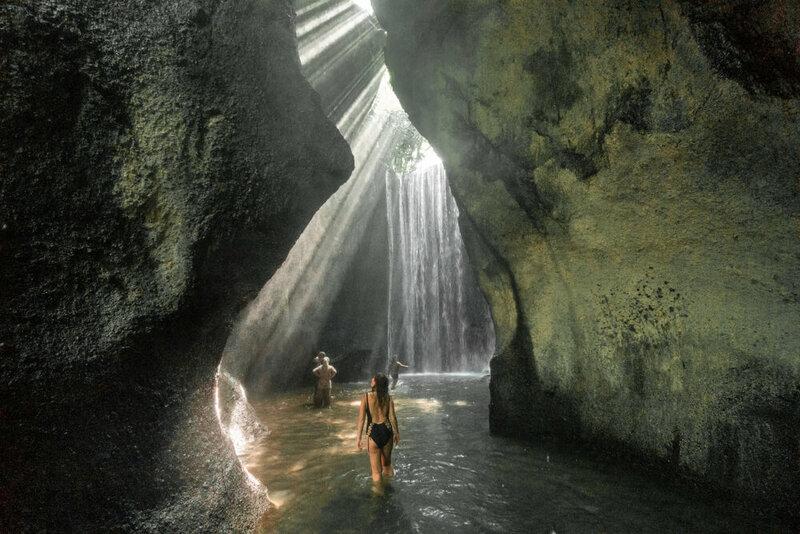 The stunning Tukad Cepung cave waterfall is one of the best waterfalls in Bali, Indonesia, and is a great place to visit on a day trip from Ubud. 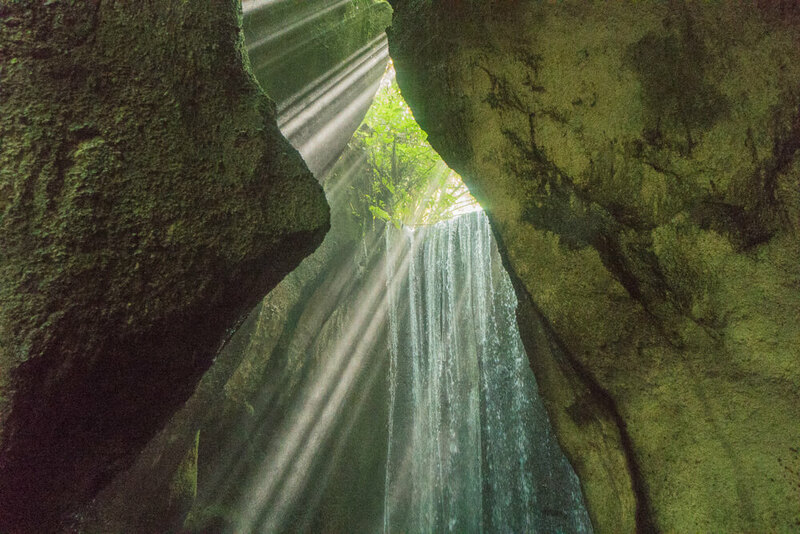 On sunny days light rays stream into the cave, illuminating the waterfall in an almost magical fashion. Although Tukad Cepung is a relatively well hidden waterfall, in recent years it has become something of an Instagram hotspot thanks to its unique location. It’s a truly beautiful spot that we believe is a worthy inclusion on any Bali itinerary. 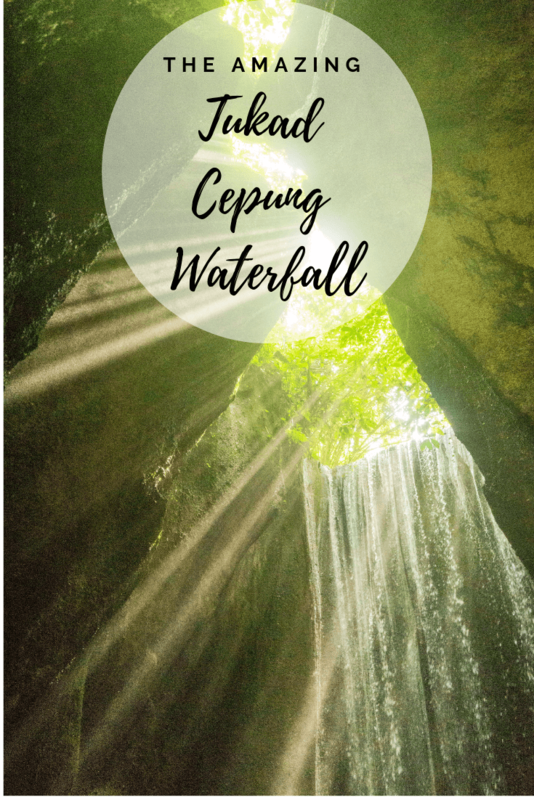 This guide covers everything you need to know to visit the beautiful Tukad Cepung waterfall in Bali! Make sure you have everything you need for your trip by checking out our packing guide for Bali! Tukad Cepung waterfall entrance fee – 15,000 Rupiah with free parking. Tukad Cepung waterfall height – 15 metres (approximate guess). Tukad Cepung waterfall is located around 30 kilometres away from Ubud in the Bangli regency of Bali. Although it is possible to visit on a day trip from a number of places on the island, it’s a lot easier to visit from Ubud. The journey to Tukad Cepung waterfall from Ubud should take around one hour. The best way to get to the falls is by scooter/bike or taxi. Renting a scooter/bike should cost around 60,000 Rupiah per day in Ubud, and you can easily follow a map on your phone to get to the waterfall. Although many tourists ride scooters/bikes in Bali without a license, it is technically illegal to do so. If you are involved in an accident and don’t have a valid license your travel insurance won’t cover you and you could get in trouble with the police. It’s up to you whether you take the risk, but it’s best to take this information into account! A taxi from Ubud to Tukad Cepung waterfall should cost around 200,000 Rupiah return or around 500,000 Rupiah for a day trip. If you opt for a day trip you can then combine your trip to visit a number of other places near Ubud such as the stunning Tegalalang rice terraces, Tegenungan waterfall, Tibumana waterfall and Kanto Lampo waterfall. If you are looking to visit Tukad Cepung waterfall from Kuta or Seminyak, expect the journey to take around an hour and a half to two hours. After you arrive, pay the 15,000 Rupiah entrance fee and begin your walk to the waterfall. It takes around 15 minutes to walk from the car park to the waterfall. The path to Tukad Cepung waterfall consists of very steep steps. Although the path isn’t as bad as at Sekumpul waterfall, it still gives your legs a good workout! Once you reach the bottom of the steps you need to turn left and wade through the shallow river. After a few minutes you will reach a cave with a large boulder inside. Follow the path a little further round and you will reach the waterfall. If you visit on a sunny day between 9am and 2pm, you should see rays of sunlight shining down over Tukad Cepung waterfall. It is the wonderful location within a cave alongside the rays of light that make the waterfall a truly stunning place to visit. Take your time to enjoy the waterfall and get as many photos as you want. As Tukad Cepung has become an Instagram hotspot there may be a lot of other people taking photos, so you may have to wait a while to get a shot without other people in. The walk back up to the car park will take slightly longer as you have to climb back up the steep steps. It’s a tougher workout than the way down, but it’s well worth it to visit one of the most beautiful waterfalls near Ubud. It’s best to avoid visiting Tukad Cepung between December and February, as these are the rainiest months in Bali. During these months the cave can end up flooded due to heavy rainfall, making it impossible to visit the waterfall. The best time to visit Tukad Cepung is between April and October as the chance of flooding is much lower. The best time of day to visit Tukad Cepung waterfall is around 8am or 9am. This may seem early but the waterfall is starting to become a very popular spot to visit. By arriving early you have a good chance of avoiding crowds of tourists, making it much easier to get some beautiful photos! As the waterfall is famous for the beautiful rays of sunlight shining into the cave, it’s best to visit Tukad Cepung on a sunny day. The rays of light can be seen from around 9am until 2pm, although the times can vary slightly. If you arrive to the Tukad Cepung waterfall around 9am on a sunny day you’re almost guaranteed to see the rays of light – especially if you’re willing to wait! Get into your swimwear – Once you reach the waterfall you can get right underneath it if you want, so it’s a good idea to have swimwear on in advance. There’s nowhere at the falls to change, and you may also get wet as you wade along the river to the waterfall! Second waterfall – If one waterfall isn’t enough for you there’s actually a second waterfall at Tukad Cepung. Follow the path to the right once you reach the river and it’s just a few minutes walk away. Don’t wear trainers! – You have to walk through water to get to the waterfall, so if you wear trainers they’re going to get soaked. Make sure to have suitable footwear for your visit – whether it’s flip flops or water shoes. It’s important to make sure your footwear has good grip too as the stairs down can be quite slippery! Take your time! – It may seem obvious but it’s important to take your time. The stairs down to the waterfall are very steep and often slippery, so if you rush you could fall and hurt yourself. Although it can be hard work, the walk is doable unless you have mobility problems. Tour guide – No tour guide is needed to visit Tukad Cepung, so if anyone offers a tour to the waterfall then save your money. Although we didn’t see any guides offering their services here, it is common at some other waterfalls in Bali. The path is easy to follow and a guide would add no real value to your experience. Make sure to check out our tips for travelling Bali before your trip! Like this guide to Tukad Cepung waterfall near Ubud, Bali? Pin it!